What primers are universal? The best powerbank for phones, the best energy banks for laptops and the best starters for starting combustion engines. We are still missing pita, pitu and energy. The twenty-first century is a wonderful time. We do not even realize how much easier life we ​​have. Computers and the Internet have revolutionized our lives. Using computers, tablets and mobile phones, we can order various items for ourselves. We can check all kinds of information. The devices are also able to guide us to the chosen place. It is impossible to list all the facilities in life that electronic equipment gives us. As it is good, it is good. We are very used to all kinds of facilities. We do not think when we check the weather for today on a smart phone, or when we check what happens to a friend. The tragedy (and it is worth emphasizing this word) begins when we do not have access to these devices. Do you remember the situation when you had to call somewhere, and there was no more energy on the phone? Modern devices make life easier, but when we do not have them, we can see how we need them. Certainly everyone met with a situation when you had to call somewhere or check something quickly on the internet, unfortunately you could not do it because we ran out of energy. We are so busy that we often forget to check how much energy is still in the device. When you have a long bus or train journey, do you always have enough energy on your laptop to work freely? When you're working on an interesting project. When the boss asked you for an important task. In addition, a business trip overlapped with it. No problem, you'll work on the bus or train. Unfortunately, the journey is long and you will not have enough energy, which you have in your laptop. You could use an electrical outlet or an extra battery. The situations described above are commonplace, and the most interesting one device is able to help you in each of them. Think about the DOCA starter. What does the DOCA D589 15000 mA starter contain? The device is very small and very light. Portable chargers are 160 mm X 79 mm x 37 mm. Have you ever seen such small batteries somewhere? These energy banks, as I wrote above, can also be used to start combustion engines. So why are not such small batteries used in cars? These powerbank batteries do not replace batteries, they can generate a 900 A inrush current, and a peak current of 1100 A. So energy banks do not power like a battery, they only serve to start the car. The device is very light for its capabilities, it weighs only 450 grams. The charger's housing is made of high quality plastic, covered with rubber. The whole is made very carefully. Generally, it makes a very good impression. 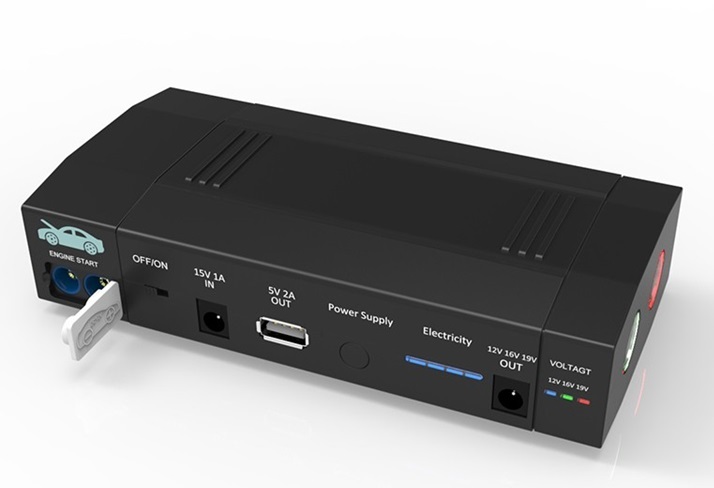 Starter DOCA D589 can power devices (for example, laptops) 12 V, 16 V, 19 V. In addition, the composition includes various terminals that allow power to various devices (for example different laptops). Like most power banks, this device powers / charges 5 V phones and other electronic devices (MP3, electronic cameras). A very interesting element built into the device are lamps. 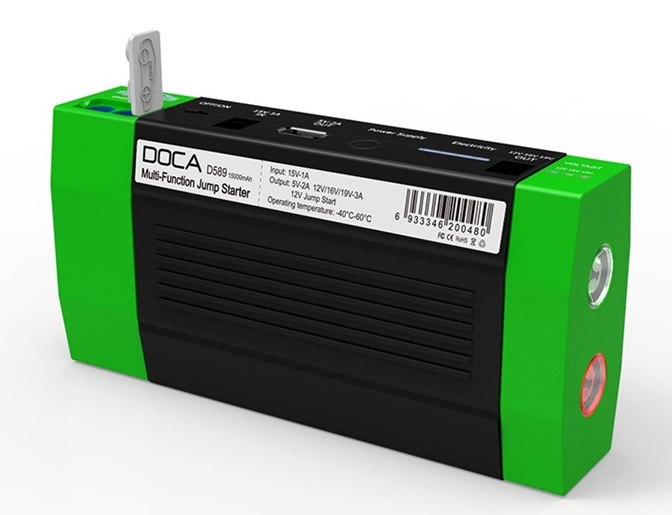 DOCA D589 energy banks have two LED lamps. The first one shines white. It is a great tool for illuminating objects. We will certainly appreciate this fact on camps or other trips. The second lamp shines red. It can serve as a warning light when we want to warn other road users. We have been dealing with powerbank for many years. During this time we have gained great experience and we have a lot of knowledge about it. On our pages you will find many curiosities related to energy banks. At the same time, we are always at your disposal. Do not hesitate to call bell 516 077 801 or write us rigroup (at) poczta.fm We recommend DOCA products, because we believe that the equipment produced by this company is professional and reliable. A beautiful future ahead of you. Imagine how much less stress you will have. Forget about the lack of energy on your phone, forget about the fact that you will not be able to work if you want to work on buses or trains for a much longer time. End asking your friends for help when you forget to turn off the lights in the car. You can handle it yourself. The future belongs to you. We offer up to one year warranty for products offered in our RI group online store. Another so long? Because we are convinced that our products are reliable. If you are not satisfied with our products, simply give them back. At the top right side you have the "to basket" button, press, and your order is already in the basket. There is a trash symbol on each page. You click on this symbol. You check the order and click "to checkout". At the very end you choose whether you leave your data, or order without leaving your data.